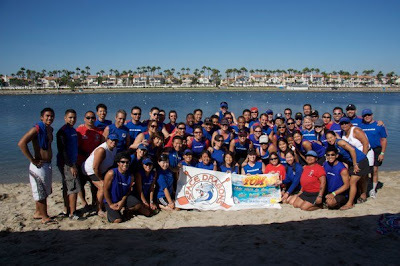 Space Dragons Dragon Boat Racing Team: LB - Bigger, better, and Weddingrific! LB - Bigger, better, and Weddingrific! Okay so I missed Big LB due to a wedding...judging by the poll on the right, that was a popular decision. Anywho Felicia Chanco was nice enough to bang out a recap so enjoy! Let’s break down what this “success” really was. Starting with Space Dragons’ WONDERFUL WHITE! Although not exactly having the best results from the 500 meter heats, they took what they had (SHOOTING OUT OF THE GATES LIKE HUNGRY GREYHOUNDS FOR A RABBIT!) 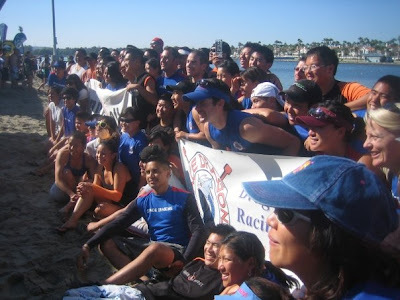 and applied it to the Long Beach Special: 200 meters. After smoking the competition in their first 200 meter heats, I was given the honor of calling their final heat. They were so very excited yet calmly focused and determined to repeat the results from their previous heats. And, well… THEY DID! The Space Dragons family now includes the 200 meter Division III Reigning Champions! First… NUMBER ONE… out of 35 teams!! Congratulations, White! Way to REPRESENT! Just being in Division IA is a success within itself and, on top of that, ROCKIN’ RED’s success was solidified by winning bronze in the 200m Division I race. Heck yeah, Red… HECK. YEAH. 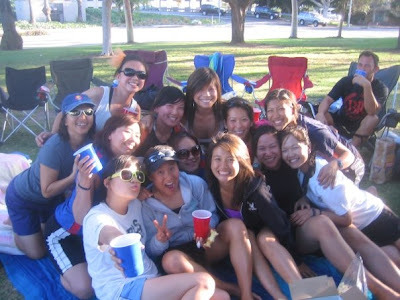 After all the paddling, sweating, and getting sunburned… there is no better way to wind down but with CIRCLE OF LOVE. (newly named CoL) Apparently, this CoL was twice as big as last year… MORE SUCCESS! But, this being my first time at the Circle… HAHA… not TOOO sure what was going on but it was A BUNCH OF FUN! Thanks Brian for all the special beverages (but of course… I have NO idea what that is…) which induced a lot of crazy behavior (*please see side note after paragraph). 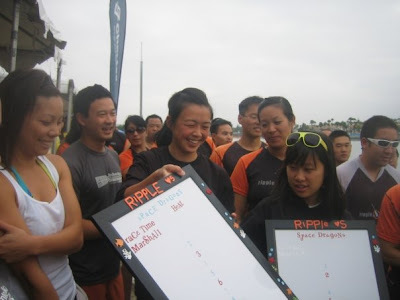 SUCH AS… POPCORN WARS, and probably the highest number of attempts to give EYEHICKEYS ever witnessed... A lot of fun and a lot of love… and of course, we cannot forget Ripple EFFECT… there probably is no better sister team for the Space Dragons than they are… who paddles and PLAYS just as hard as we do! YAY FOR CIRCLE OF LOVE! *Just in case anyone forgot… THERE IS FOOTAGE OF CEEZ AND PHIL KISSING! Someone like Phil (aka Animale) who thought about Tom during our weekend of festivities. By making a poster for everyone to sign and send their wishes to Tom as he is going through a tough time, Phil exemplifies the Space Dragons spirit, by taking care of their own, on or off the race site. Again, a sister team like Ripple Effect! Every tournament is just that much more SPECIAL when we experience it with the fabulous RFX. Thanks again for the whiteboards… those gifts were GREATLY appreciated! 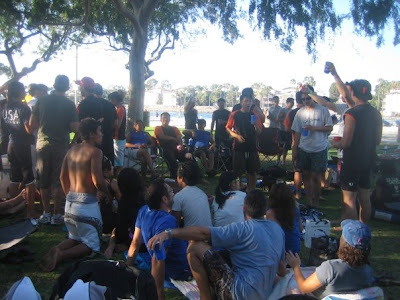 All of the callers and steersman that SURVIVED yet another STRESSFUL tournament… with all the weird starts… I’m surprised that none of you guys passed out with all the craziness. GOOD JOB! AND OF COURSE!!!! THANKS TO ALL OUR COACHES AND CAPTAINS THAT KNOW HOW TO GET THINGS DONE! MAKING SPACE DRAGONS THE NAME ON THE BEACH! WE WOULDN’T BE WHERE WE ARE WITHOUT THESE VERY HARDWORKING AND DEDICATED INDIVIDUALS. MUCH LOVE FOR YOU GUYS!! And because, I am COMPLETELY DENSE to all the background workings that make this tournament possible and successful… THANK YOU TO ALL THE PEOPLE WHO DESERVE A THANK YOU! YEAH, THAT MEANS YOU! Some closing remarks: We, the Space Dragons, have such a BRIGHT FUTURE ahead of us. Each tournament that passes by, we find ourselves that much stronger and no one can deny that we are setting ourselves up for that much more success. All the hard work that we all have put in IS paying off.